Most married couples survive by gritting their teeth and holding on. But what if husbands sought to truly cherish their wives? What if in social settings they did their best to make sure she was heard? What if they supported her goals so she could work in her gifts? What if they bought the things she needed to open up her home and put the beauty of her hospitality on display? And what if wives adopted the same attitude? What if she made sure her husband knew she was his strongest supporter? What if she were willing to support him, stabilize him, bind up his wounds-spiritual and emotional-and turn him so his strongest side was always showing? What if she helped him risk failure out in the world because she made it known to him that he would always be her courageous champion? What would that do to him? For the relationship? 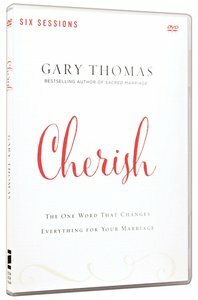 In the Cherish Him, Cherish Her video-based study, bestselling author Gary Thomas shows how marriages can not only survive but also thrive when husbands and wives learn to cherish one another. How we can go from neglect and disrespect to cherish and adore. How we can send our marriages into a different dimension. How we can recalibrate our marriages when needed so we don't suffer from apathy, indifference, and gradual drift. None of us want marriages where we grit our teeth and just tolerate each other because God's Word says we don't qualify for divorce. We don't want marriages where our spouses really don't like us, much less respect us. We want to be married to someone we cherish and who cherishes us, and it is possible to get to that point. About "Cherish (Dvd Study, A)"